Halifax's Quentin Laulu-Togaga'e goes head-to-head withBradford Bulls' Jake Webster during the Yorkshire Cup. PIC: Simon Hall. With the 2019 Betfred Championship set to get underway this weekend, many are predicting it to be one of the most competitive seasons yet. A shot at promotion awaits the teams that will end the season in the top five spots. Featherstone's Ryan Carr is one of a number of new coaches in the division. PIC: Stephen Penfold. The play-offs will culminate in a Championship Grand Final, with the winner of that clash promoted to Super League. Below, we run the rule over all 14 teams and rate their chances of being promoted to rugby league's top tier. Barrow Raiders: The Cumbrian side’s home form last year played a key part in their survival. Paul Crarey’s side had been tipped to go down but a draw at home against Toronto early in the season displayed their credentials as a Championship side. This year is likely to be another one where they will look to avoid the drop. (Title odds: 100/1). Batley Bulldogs: The Mount Pleasant side have recruited well during the off-season. The Bulldogs came within a whisker of winning the Yorkshire Cup, losing a narrow contest against Bradford Bulls. Former Leeds Rhinos star and head coach Matt Diskin is entering his third year at the helm. (Title odds: 100/1). Lee Greenwood will begin his first season in charge at Dewsbury Rams. PIC:Tony Johnson. Bradford Bulls: John Kear’s side have returned to the Championship at the first time of asking, following their relegation in 2017. The Bulls have already won the revived Yorkshire Cup and are being tipped to reach the play-offs following a number of big arrivals. (Title odds: 16/1). Dewsbury Rams: The Rams have undergone a period of transition since the end of the 2018 season. A new head coach has been appointed in former Halifax assistant Lee Greenwood. A number of new arrivals make Dewsbury a bit of an unknown entity. (Title Odds: 100/1). Featherstone Rovers: Featherstone are another side who have gone through several changes since the close of last season. Ryan Carr has arrived as head coach while a number of players have been in and out the door at the LD Nutrition Stadium. Rovers have not won a single game in pre-season. (Title odds: 16/1). Batley Bulldogs and Bradford Bulls gave fans a taste of Championship action in a thrilling Yorkshire Cup final. PIC: James Hardisty. Leigh Centurions: Failing to reach the play-offs had a detrimental effects on Leigh last season. The club failed to raise 17 players on a few occasions but things are looking up this time round. John Duffy has been appointed as head coach while half-back Martin Ridyard has returned to the club. (Title odds: 6/1). Rochdale Hornets: Structure changes midway through 2018 helped the Hornets avoid the drop last year. Despite a busy off-season, with several new faces arriving, Rochdale look set to be involved in another tense relegation battle. (Title odds: 250/1). 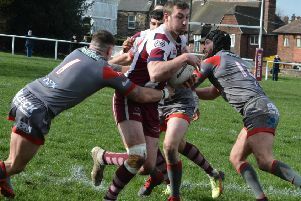 Sheffield Eagles: The Eagles have not had the best time of it in the past few seasons, but something feels different this time around. They have brought in top half-backs Patrick Walker and Anthony Thackeray, and along with their other additions could surprise a few teams. (Title odds: 100/1). Swinton Lions: The Lions, like Rochdale, have benefited from the new structure changes for 2019. They finished bottom last season and only survived after beating Workington Town in a promotion play-off. They will be dual-reg partners with Wigan Warriors this year, something that could make the difference in their battle to beat the drop. (Title odds: 250/1). Toronto Wolfpack: The world’s first transatlantic sports team are overwhelming favourites to be promoted to Super League. The arrival of Brian McDermott, a four-time Super League winner as a head coach, could give them the edge they need after they were beaten in the Million Pound Game by London Broncos last year. (Title odds: 10/11). Toulouse Olympique: The division’s only French outfit gave a good account of themselves in last season’s Qualifiers. They defeated Hull KR and Widnes Vikings but ultimately finished sixth, one place away from a spot in the Million Pound Game. They will be looking to reach the play-offs again and join fellow French side Catalans Dragons in the top tier. (Title odds: 8/1). Widnes Vikings: Relegated from Super League last season, Widnes are being tipped for an immediate return. Kieron Purtill has been named as head coach, while Super League Grand Final winner Anthony Gelling has also joined. The centre could make a real difference in their promotion push. (Title odds: 4/1). York City Knights: James Ford’s side were one of rugby league’s surprise packages last season, beating Bradford Bulls to the League One title. A push for the play-offs may be a step too far this season but it could be something they aim towards further down the line. (Title odds 25/1). *Title odds refer to which club will win the Championship Grand Final.